Ceralifimod is selective, high potent agonist for sphingosine 1-phosphate receptors 1 and 5, with EC50s of 27.3, 334 pM for human S1P receptor 1 and 5, respectively. PF-543 Citrate is a novel cell-permeant inhibitor of SPHK1 with a Ki of 4.3 nM and more than 100-fold selectivity for SPHK1 over SPHK2. 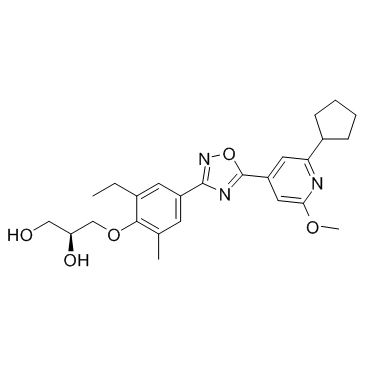 CYM-5442 is a highly-selective S1P1 (Spingosine 1-Phosphate Receptor 1) agonist. CBP-307 is a novel and selective second generation S1P1 (a G-protein coupled receptor -GPCR) modulator for the treatment of a range of autoimmune disorders, including multiple sclerosis, inflammatory bowel disease and psoriasis. JTE-013 is a potent, selective sphingosine-1-phosphate 2 (S1P2) receptor antagonist that binds to the human and rat receptors with IC50 values of 17 and 22 nM, respectively, (IC50 values >10 µM for human S1P1 and S1P3). Defensamide is an activator of sphingosine kinase (SPHK1), and significantly stimulates CAMP mRNA and protein production in KC. Reversible, competitive inhibitor of sterol regulatory element-binding protein (SREBP) site 1 protease (IC50 = 0.175 μM). Amiselimod, also known as MT1303, is a potent and selective immunosuppressant and sphingosine 1 phosphate receptor modulator. 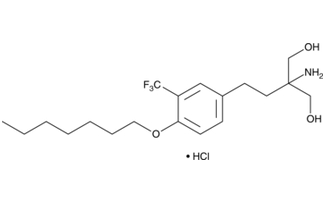 Cenerimod (ACT-334441) is a potent and orally available sphingosine 1-phosphate 1 receptor (S1P1) agonist extracted from patent WO 2016184939 A1 and WO 2011007324 A1, example 1, with an EC50 of 2.7 nM. Etrasimod (APD334) is a potent, selective and orally available antagonist of the sphingosine-1-phosphate-1(S1P1) receptor with an IC50 value of 1.88 nM in CHO cells.